The following day a further piece was printed in the same newspaper, entitled “Loneliness of the long distance runners” by John Sergeant. “Sefton Harriers are for the first time in their 80years history, having to advertise for cross-country runners. As one of the best known athletics clubs in the North, this was a drastic indeed, but as the Secretary explained last night 2 we can’t find ant other way”. Mr John Mansley of 33 Carlaw Rd Prenton, Birkenhead, puts most of the blame on football, and the success of Liverpool and Everton on particular”. It was a drastic step indeed, but drastic measures are needed to try and resolve drastic situations. Although it did not prove to be a panacea for our ills, it was most certainly a move in the right direction. The initial response was very promising. At the Committee Meeting on 1st October, a total of 29 new members were elected as a direct result of our advertisement. Robbie Wood, Steve O’Keefe. Paul Cave, Ronnie Williams, Malcolm McInyre and George Bate have all made their mark in Sefton, and were part of the initial batch of new recruits. There were still a few established members around to welcome the newcomers and make them feel at home. During our 100 years existence, there have from time to time been members whose contribution has been particularly outstanding, and who deserve a special mention when the story is being told. One such person is Bart Woods. Bart, a young Irishman who was following his profession as a teacher on Merseyside, joined Sefton during the latter half of the 1960s, and during the next 10 years he served as Captain 7 times, and was Secretary for 3 years, and was Club Cross-Country Champion on 8 occasions. His dedication to the continuing existence, and re-establishment of Sefton was enormous. He truly was the right person in the right place at the right time. Although of a serious nature in some respects, and not suffering fools gladly; his kindliness and sense of humour inspired a re-kindling of self-confidence in his fellow members, which helped us so much on the road to recovery. One of the features of the early 1970s was the encouraging numbers of youngest who joined the Club. We were able to field Colts and Boys teams for a few years; something that we had not been able to do since the early 1950s. Despite the efforts of our senior members in general, and Club Coach Jim McCaffery in particular, we were able to unable to retain the majority of this promising talent. there were several reasons for this. Being in a weakened position, we were unable to provide adequate organisation which is so vital to running and developing a successful youth section. Added to this was the usual percentage of new runners who lose interest when the initial enthusiasm wears off; and unfortunately a certain amount of enticement from other local clubs who were in a stronger position than ourselves, and tempted a few promising young runners over to their ranks. Not all of these boys were lost, Robbie Wood, George Bate, Steve O’Keefe, Malcolm McIntyre, Mike Travis and Kevin Patrick all stayed to become established Seftonians, and make it through to the Senior ranks. With hindsight it could be argued that a long established club has a better chance of surviving a lean period, than has a newly formed one has establishing itself from scratch. This case is put forward from the standpoint of an already established club having the necessary infrastructure which has been functioning for a long time. There will be people who are conversant with the business of an athletics club. In addition, there is a wealth of inherited experience in a club which has existed for 80 years. these factors, combined with tears of habit, kept us going. There always has been Committee Meetings, AGMs; election of Officials; paying ones affiliation fees, entering teams for championships ect; so we just kept on doing it despite disappointments and setbacks. It has been observed earlier in this history that “man is a creature of habit”. When the lean years of the 1970s are discussed, they appear to take on a gloomy aspect in the imaginations of our more recent members. In fact, the complete opposite was the case. As one who was fully involved during that period, the author can vouch for it being a time of very happy comradeship. True to that observation that “external enmity breeds internal amity”, the Club spirits were never higher than when we were in adversity. We competed in the same championships, albeit with weak teams, had companionable coach trips, and were involved in many activities. During the 1970/71, at the popular request of members, we undertook a series of sponsored runs/walks. The first one was to raise money for seriously depleted Club funds. This was a moderate success, and was followed by others. Turning our attention outwards, we donated the proceeds of these to a local charity. Alder Hey Children’s Hospital Fund was a main beneficiary. these activities raised morale as well as money and fostered the concept of working together. 1971 was a year of departures in one way and another as it marked the deaths of three of our longest serving members. At the AGM that year our President, Stan Lubbock spoke about Arthur Hill, Bill Davies and Ted Rogers, and the meeting stood in tribute to their memory. On a much less sombre note; a good Pembroke friend of ours Danny Gilfoyle, emigrated to South Africa. This is mentioned as it is an unusual case. Danny, who the author has known since the 1950s was an above average distance runner, who for many years did his Saturday training runs at West Derby with Sefton. There was never any question of Danny leaving Pembroke, but he joined us as a second claim-member and was regarded as “one of the lads”. The boys in Sefton made a collection and presented him with a memento of his years of association us at a quite and moving little ceremony after the Sefton Park Road Relay. This may be the only example of of it’s kind, when the members of one club have shown their regard for a member of a rival club in such a manner. Club Championships were being keenly contested, with Bart Woods as the dominant runner; although his run of consecutive victories was interrupted for one year in 1974 when a young and promising Peter Montgomery upset the form by beating Bart to take the Senior title. In the early years of the 1970s the Club Track Championships, based on aggregate performances, were notable for the tussles between Bart Woods, Kevin Patrick, George Bate, Steve O’Keefe and Mike Travis. The latter pair actually tied for the Championship in 1972 and 1973. The minutes of the Committee Meeting on the 1st April 1970 recorded that Bert Searle left the Liverpool area and moved to North Wales. In 1973 Bert’s contemporary, Harry Kay, retired and left his native shores to go and settle in the Lake District. They are both still living in happy retirement in places of their choice, and long may they do so. Life in Sefton went on and things were gradually improving. One of the greatest boost to the Club’s health and fortunes, was the arrival amongst us, on the 19th September 1973 of Brian Flanagan who was elected to membership on that date. This ex Royal Marine who joined us from Bath AC, was a real “shot in the arm”. His love of running, and boundless enthusiasm was infectious, and we all had to get a move onto keep up with him. Brian served as Hon Secretary for three years from 1976 to 1979, and was Captain in 1979/80, 1980/81, and 1981/82 seasons, but undoubtedly his greatest single contribution, has been the Club Newsletter for the past 15 years. has developed to become one of the key factors in the Club’s recovery. Such is the quality of the Newsletter, it was recently highly commended in a competition held by a national running journal. The Winter Ranking List is another of Brian’s “babies”. He introduced this at the same time he took over the Newsletter, and it is now one of the most keenly contested of the Club awards. In this welter of organising activity let us not forget Brian Flanagan the runner; with and avowed dislike for the winter season and running over the country, his preferred sphere is long distance, where he turned in several sub 2.40 marathons, being Club Champion at that distance in 1977. The winter season of 1973/74 brought with it signs of a renewed spirit within the Club. We were still having difficulties fielding complete teams at times, and athletics success was still some way of, but there was a real camaraderie amongst the members, and a desire to get on with things as a Club. The Cumella Cup was being held every year with the whole hearted effort from everyone involved. There were successful efforts to revive the social scene. George Bate ran a series of of Dances at Crawfords Social Club, where incidentally we were still training regularly. the once traditional Hot Pot Supper was revived and ran for seven consecutive years, bringing many old friends together, to give a sense of history and substance to the Club which many new members had not experienced. A new tradition we begun that year; well they have got to begin at sometime, when Wrexham AC. invited us to what was then a closed event. the Bala Road Race, a run over 111/4 miles around Bala Lake, was new territory for Sefton, and we began well by gaining 3rd team place. this was the start of a happy association with the Wrexham club, which came about when our Hon treasurer, John Kay moved to that town with his job, and was training with them regularly. We became good friends with the Wrexham lads and enjoyed many hard fought inter-club matches with them on the track and over the country. John Kay eventually gave up the Treasurership of the Club in 1980 when the travelling between Sefton and his home in Wrexham became too much. John had served us well as Hon treasurer for a total of eight years, and when he stood down, his place was taken by his assistant George Willan, who has filled the post so ably to this day. In 1973 Paul Cave, who won the Club Marathon Championship in 1975 took Sefton into a new domain when he ran the London to Brighton Road Race, and did us proud by finishing in 11th position. Paul only had a brief spell of a few years with us, but during that time, we were privileged to observe a talent which did not reach it’s full potential. 1974 came and Sefton were slowly emerging from the shadows. A great honour came to the Club when our President Stan Lubbock was elected as President of the English Cross Country Union. This was the pinnacle of a lifetime of service that Stan had given to the sport, and a fitting acknowledgement of all that he had done. On January 12th we went “public” and hosted a Liverpool and District Cross-Country League fixture at west derby, which went off very successfully. the confidence and experience gained from this venture encouraged us and in June we staged a six-club invitation 5 mile Road race at west derby. Something of this nature could have been envisaged a few years earlier, and appreciation shown by the visitors, did our ego a lot of good. The race was won by Liverpool Harriers. In the Track Championships that summer Mike Travis won the 100, 400, and 800 metres, with Paul Cave taking the 1500m and the 3 miles. A very promising youth named Paul Crompton, won the 100, 400, 800 and 1500m in his age group. What does become of so many of these talented youngster? Autumn came and Sefton and a tem in the Lancashire Road Relay Championship at Southport for the first time in several years. It was good to see the Club back in the County arena: we were not last and we were not disgraced. The 1974/75 Cross-Country season was upon us, and the changing world was effecting something that Sefton had taken for granted for so long. For over fifty years the Club had enjoyed the privilege of running over the Croxteth Estate, but as a result of Lord Sefton’s death, the land had eventually passed into the hands of Liverpool Corporation, who were now to issue permits for such use. Last season’s venture in putting on road races had increased the growing belief in ourselves, and in December 1974 we staged the H.S Finney Trophy, which took the form of a 4×3 mile cross-country relay. The day was bright, dry and sunny. The going was fast and firm over the grassland of the park, and the whole event was a success. Sefton managed to field an “A” and a “B” in a race that was won by Liverpool Harriers from Pembroke in 2nd position. The year turned, and on the 11th January were hosts to the Liverpool and District Cross-Country Championships, which was carried off with great aplomb; appreciation being expressed by all the competing clubs. Our running Club strength was still not such to bring success in races, but we had retained our standing as members of the local athletics community, and were contributing to the sport as much as anyone. 1976 brought in two new members worthy of recording. A young lady called Alison English joined us. Alison who was still at school showed great promise at middle-distance running, and the prospect of a Ladies Section in Sefton Harriers was welcomed with enthusiasm. However, with hindsight, the time was not yet right, and due to changing accommodation difficulties, and the general unreadiness on our part, that particular development did not materialise then, and we had to wait another few years. Another member who joined in 1976, and has stayed to become one of the core men of the Club, is Alan Cadwallader. Already in the veterans ranks when he joined Sefton, Alan settled in “without touching the sides” and lost no time in adding his own particular style of enthusiasm to the situation. Alan competed very effectively for a number of years, turning in some excellent performances, particularly in long distance races. recently he has been troubled by a hip condition and has turned back to cycling as a way of keeping fit. Despite this difficulty, he is still involved in the Club affairs as ever he was. Our now established involvement in the organising of races at Croxteth Park, is in no small way due to Alan’s mastery of the art of course marking, which has been his forte now for some 10 years. In the tradition of the whole families being involved in Sefton, Alan has four sons Philip, Paul, Alan and Lee are members of the Club and compete regularly. Further evidence off changing times was made apparent in 1975/6 when in addition to the problems concerning our courses on the estate, we began to have difficulties with our long used changing accommodation in West Derby Village Hall. The situation “limped” along for a year or two more but it was apparent that things were never going to be the same again. It is happy to record that these extra running problems did not check our gradual improvement, and viewed from a distance in time, one can see the gradual rise in standard. In the context of the time, a great moment came when we gained 3rd team place awards in the Pembroke 20 mile Road Race in 1977. The team of Brian Flanagan, Peter Montgomery and Alan Cadwallader gave us our first tangible success for a long time. By the winter that year, competition for a team place had grown so, that at the December Committee Meeting, the formation of a selection committee was discussed. We were now fielding full teams in the winter season, and appearing on the results sheets. Another of Brian Flanagan’s contributions to Club life not hitherto mentioned, is the Royal Insurance connection. An employee of that Company himself, Brian has introduced scores of new members from among his fellow employees. One of these, was a veteran when he joined us , is Darrell Gardiner, who was previously a member of a London Club, reached his own half century in 1978. He had spent so many happy years of his life in running, and had derived such satisfaction from his association with the sport, that his wish was to celebrate his 50th birthday in a way connected with it. To this end, he invited all members of Sefton, as well as some running colleagues from the Royal Insurance Company to his home in Formby, to have a run along the beech to Southport Pier and back; a total of 14 miles. This was to be followed by a social evening at his home. The event was a resounding success, and by popular request was repeated the following year. It could not stop there , so it took it’s place on the fixture list along with all the other “set pieces”. Links with the Royal Insurance Company element were strengthened and a team race incorporated at a very early date. From time to time there has been a Ladies race included when the occasion demanded, and some ladies have run the whole distance. Darrell did not realize what he was starting back in 1978, for like Topsy, his “Beech Run” just “grew and grew”, and last year his 60th birthday was celebrated in the same manner. The Club owes Darrell and his wife Sheila a debt of gratitude for enriching our lives by their contribution during that time. roots again into his native soil. Bart’s part in the Sefton revival had been enormous. The bare statistics show that he was 7 times Captain, 3 times Hon Secretary and Senior Cross-Country Champion on 8 occasions. What the statistics do not show is the spirit of the man, and how he was able to share it and influence those around him with that spirit. His contribution to our well-being cannot be measured in facts and figures, but the warm affection in which he is held by those who knew him, and the present health of the Club is testimony. Bart’s role as Cross-Country Champion was, for the next three years taken on by Dave Evans. When Waterloo Harriers sadly disbanded a couple of years earlier, Dave had moved to Liverpool Harriers. An athlete of remarkable versatility; he could not find a regular place amongst the formidable array of talent in Liverpool, and so without any animosity, chose to come to Sefton Harriers. It was an excellent move; Dave’s ability was not being wasted, and we were delighted to have it used on our behalf. In January 1979 the Club was saddened by the death of Stan Lubbock. It was a great loss to us, as Stan had stood by Sefton through thick and thin for over 50 years. He had experience of the heady days of the 1920s and 1030s, and the struggling years of the late 1960s and early 1970s. It is something of an irony that his departure from life came just after the Clubs fortunes were on the upturn. A lifetime of service to the Club in particular, and the sport of athletics in general, meant a large turnout at his funeral, widely representative of the running community, who recognised the worth of a man who had served so long and selflessly. Stan’s successor as our President was Reg Vaughan, who, some 10 years later, and in our Centenary year, is still the popular holder of the that office. In an earlier chapter, Reg has been described as a “young stripling”, when he first turned out for us back in 1850. Time marches on. and within the span of 30 years, Reg had become the head of the Club, where we hope he will remain for many years to come. With Stan’s passing, the decade of the 1970s was drawing to a close. Although we did not know it at the time, the 1980s were to bring about a change of fortune for Sefton. the phenomenon of the jogging boom, and the enormous increase in running interest, heightened the profile of our once almost secretive sport, and swelled the membership of many clubs as well as that of Sefton Harriers. It is hearting to see how many of these members are still involved in the he Club activities after 10 years. One; Ian Ellington actually left the sport and happily has returned to be running regularly again. When one looks back to the beginning of the 1980s, and takes abroad view of the scenario of the Club at the time, it is clear that the working core of officials who were willing to, and capable of taking on the responsibility of organising events. Add to that a group of keen and promising young runners who were eager to do well in competition. The third element, which acted as a catalyst, was the enormous increase in awareness of what running has to offer to so many people. This latter element viewed in a social context; that mass unemployment, and many people with time on their hands, searching for something worthwhile to do with that time. Some of them joined us, and slowly as all of theses ingredients blended, a new and much more potent Sefton Harriers began to take shape. the first of Dave’s three Club Marathon victories; the others being in 1982 and 1983. 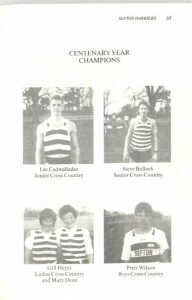 Also recorded in 1980 was our 2nd team placing in the Red Rose 20 mile Road Race. When the winter of 1980/81 came, we were back into the cross-country scene, and staged one Liverpool and District Cross-Country fixture at West Derby. It was in this season that Martin Shackleton won the first of his four consecutive Club Cross-Country Championships. Martin was previously with Leigh Harriers, is one of the runner who joined us through the Royal Insurance connection. 1981 was unique in that it gave us our first ever Ladies Cross-Country Champion. This was Pauline Parry, wife of Martin Parry who was a friend of Dave Thackerey’s and a member of the B.I.C.C club, which was a source of some good runners. Perhaps the most significant event of 1981, from a point of it being a indicator of overall Club strength, was our being able to enter a team in the Northern Counties 12 stage Relay. This was an important milestone on our revival road, and we have continued to be represented in this event since. with our performances showing a steady improvement year by year. 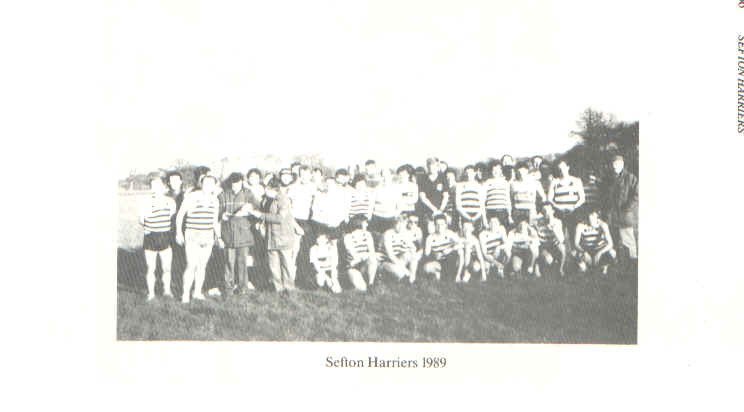 In 1981 there was an even larger entry for the Club Marathon Championship, when a total of 15 Sefton Harriers faced the starter at Sandbach. this time, victory went to Dave Evans with an excellent time of 2.36.20. Dave Thackerey was 2nd in 2.42.32 and John Dobie 3rd in 2.49.51; all were personnel bests! The shorter races were not being neglected by the Club, for in the Wallasey Road Relay our “A” team ran well to gain 3rd place, and our “B” as well being placed 5th, also took the award for first “B” team. Adding an interesting touch of variety to Club activities; Mike Travis took to two wheels, when in May of 1981 he rode his bicycle from Lands End to John O’Groats for charity, and maintained the traditional links we have with that sport. This summer of promise faded into autumn and we were soon into the the 1981/82 cross-country season. There was still difficulties with the question of a winter headquarters. A local Residents association were allowing us to use their premises on a week to week basis, but it was not a satisfactory arrangement. Despite the problems of accommodation, in 1981/82 proved to be a good season for us. In the first two Liverpool and district fixtures at Ellesmere Port and Sherdley Park, we finished 4th place, which was to be our final overall position at the end of the season, out of a total of 11 Clubs. A marked improvement could be seen in our team placing at the Northern Cross-Country Championships where we were placed 22nd team out of 51 (29th in 1980/81) and in the National, where we finished 54th out of 173 (81st in 1980/81). The upward trend continued in the Spring of 1982 at the Northern 12 Stage Relay with 27th position out of 35 teams. Membership continued to grow at a healthy rate with more and more promising runners signing on. 1982 was the year we were joined by Dave Fairclough and Chris McFadden; two members who were soon to make their mark in the Club annals. In the summer of 1982 we repeated our 1980 performance, and finished 2nd team in the Red Rose 20, with 3rd team placing in the Pembroke 20. Later on in the autumn, our Veterans distinguished themselves by winning the 1st Vets’s prize in the Sefton Park Road Relay. In the same event our “A” team gained an excellent 4th place. The recognition of the Clubs improved standings was received with satisfaction, when Steve Bullock was selected for a West Lancs Cross-Country Association representative team, with Martin Shackleton as reserve. Steve ran well to finish in 28th position as 4th counter for the West Lancs team. Steve Bullock joined Sefton on 19th September 1979, and in his years of Club membership, it could justifiably argued that he has been one of the most consistent cross-country runners in all that time. However his abilities are not solely to be seen over the country, for he won the Club Track championship in 1982 and 1983. 1983 was another good year for road men with 2nd team places in the North Wales 10 mile, the Pembroke 20, Wallasey Road Relay, and the Freckleton half-marathon. It was obvious to the interested observer that the members of various teams, in addition to improving performances, were growing in confidence and a belief in their abilities. It was only a matter of time before they would be in 1st team position. Excellent results in the Sefton Park road Relay (3rd team) and the Lancashire Road Relay (7th), augured well for the coming cross-country season. 1983 was a good year for recruitment when, amongst many others we were joined by Mary Dean, Steve Murphy and Colin McCallum. The 1983/84 season saw us hosting the Liverpool and District Cross-Country Championships at Croxteth Park in the most appalling weather conditions. freezing cold temperatures and driving snow made it a day to remember. Credit must go to all who took part, either as officials or as a competitors. The promises that were made in 1983, were kept in 1984. We went one better in the North Wales 10 and actually won the team race, with our “B” team finishing in 3rd place for good measure. Although we had to settle for 2nd team again in the Eccles 10, our performance in the Southport Beech 10 mile took us from 3rd to 1st team. The Ormskirk half-marathon also fell to Sefton Harriers when we finished in 1st team position. Pride of place for 1984 must go to our Marathon team. The Sandbach Marathon, which for several years we had used for Club Championship, was not suitable for us in 1984, so after some discussion we decided to that all contenders should travel to the Telford Marathon. What a day it turned out to be! We won the team race comfortably, and our own Dave Fairclough was the 1st man home, with Chris McFaden in 3rd place. Dave was the first Sefton harrier to win an open marathon race since Charlie Ellick’s victory in the Doncaster to Sheffield in 1952. In keeping with the winning ways that summer, Mary Dean recorded the first ever victory by a Sefton lady, when she was 1st home in a large field in an all-ladies 10km road. In his annual report to the AGM in September 1984, the Hon secretary made particular mention of the growth in membership, which amounted to 39 new members during the previous 2 years. New members in 1984 included Derek Pellat who joined us as a veteran, and is now regarded as one of the pillars of Sefton harriers; also two more ladies, Gill Hayes and Elaine Bishop who have become very keen and actively involved runners. interest and concern that we should be more involved in track and field competition. throughout the lean years, we contrived to hold our Club Track Championships every year, although on some occasions, the numbers taking part was very small. It had been some time however since we had been involved in a track and field competition outside our own Club. Through the determination of a small band of devotees, and a with the support of the Club, it was decided that we should apply for membership of the Northern Track League. We were eventually invited to take our place in Division &W for the 1982 season. In the light of our recent inexperience in these affairs, it was a challenge to us, as entailed organising a one home fixture each season. Nevertheless the challenge was met and we performed to the best of our ability; and although we have not won our division, we have produced some good performances to keep the Club in the sphere of the sport, and to give opportunity for track and field athletes to compete. In the first few years of our involvement in the Northern track League, Track Captains Ian Craig, Steve Bullock and Nick Hoyle were well to the fore in raising awareness, and they worked hard at establishing a team. It has not been easy, but work continues. Meanwhile our own Club Track Championships were being held with Kevin Patrick winning the title in 1980. In 1981/82 Steve Bullock took over the role, followed by Chris McFadden in 1983 and 1984. The 1984/85 winter came, and after a four year reign by Martin Shackleton, Graham Cairns won the Club Cross-Country Championship; the first of his three consecutive victories in that event. It was a good year for Graham; he also came on top of the Winter Ranking List, and won the Club 10 mile championship. The Ladies Championship was won by Mary dean. The West Lancs Cross-Country Championships were held at West Derby that season with Sefton as host Club. In the summer of 1985, we were competing in the Northern Track League, with Nick Hoyle again as Track Captain, and Steve Bullock and Ian Craig gaining some good results. On the road, Dave Evans won the Waterloo15km Road Race and the Club won team “firsts” in the Ormskirk Half-Marathon, North Wales 10 mile and Telford Marathon with Chris McFadden, Club Champion at the 26 mile distance. To demonstrate his all round abilities, Chris also won the Club Track Championship. Membership was still growing at a healthy rate, and at the AGM in September , the Hon Secretary reported that 21 new members had joined during the year. In the autumn of 1985 we finished 3rd in the Sefton Park Road Relay, and in the winter following, Sefton gained the team bronze medals in the West Lancs Cross-Country Championships. Not to be left out of the honours, our ladies also won the bronze medals on the Merseyside Women’s Cross-Country Championships. In May of 1986 we lost one of the most popular and well liked members of the Club when Barry Charnock died suddenly from a heart attack at the age of 41. Although he was never a runner of note, Barry was a great clubman who served on the Committee for several years and was always willing to help in any way he could. In his latter years Barry was developing his skills as a writer, and was a regular contributor to the Club newsletter. His descriptive poems about cross-country events were very evocative of the atmosphere surrounding the winter season, and gave enjoyment to many people. He is best remembered for his ever readiness to act a course marshal on cross-country and road races, even in the worst conditions. Barry is still missed by those who new him well, and it is good that his memory is kept alive with the “Barry Charnock Trophy”, awarded each year to the winner of the Christmas Handicap. Summer 1986 was a busy one for the road men who continued their run of success with several 1st, 2nd and 3rd team placings. New young talent dominated the Track and Field Championships, witch were now divided into several groupings. Young Paul McGrath won the middle distance section, Kevin O’Brien the long distance, while Graham McDonald won both Sprints and Field events to take the overall Track trophy. The Fell Championship, which is a recently introduced event was won by Dave Fairclough in the Snowdon Race. Fell running, along with Triathlon, is just another indication of the breath of interest in the Club. Andy Willan and Mike Travis have been enthusiasts of the former of these disciplines, for a few years, and as a result of an increase in interest, a Club Championship was introduced. such was the effect, that we placed 2nd team in the Frodsham Hill race in 1986 and 1987. The taste for running up and down mountains is one that had been indulged in for some years on a more social basis by members taking part in the annual Moel Fammau run. This began some 10 years ago when a few hardy specimens got together on the first Saturday after Christmas, to “blow away the cobwebs”, and start the New Year well. Like Darrel’s Birthday Race, it caught on and the originators George Willan and Alan Cadwallader, are now past their running days, but still make the yearly pilgrimage to the venue, just to keep an eye on the situation, and make re that everything is done properly. Although we do not yet have a Tri-athlon Championship, we do have several very good bi-athletes and tri-athletes in the Club. Club Captain Steve Murphy and the young Cadwallader boys can turn a nifty pedal and have done well in several open events. In addition Ray Pugh, a former Cycling Champion, has won several bi-athlons and Steve Fenny was 2nd in the UK Short Course Tri-athalon Championship two years ago. Under the energetic Captaincy of Chris McFadden, the Club enjoyed a level of success that we had not experienced for years, and 1987 brought us even more. In the autumn, just as Steve Murphy took over as Captain, Sefton for the first time in our history, won the Sefton Park Road Relay. It was a great day for all concerned, and a deserved reward for all the hard work that had been done in the preceding years. To complete Sefton’s day our “B” team were 5th; being first “B” team, and our over 40s won the Veterans award. The relay season continued well for us with a 7th place in the Burtonwood event. By finishing 11th in the Northern 6 Stage Relay, we qualified for the National 6 Stage at Crystal Palace. Brian Gillespie won the Club Marathon Championship by running a fine 2.28 in the Mersey Marathon, and to round off the year nicely, Mary Dean won the Northern Veteran Ladies 10km Track Championship. Liverpool and District Cross-country League, we were placed 3rd team in both the Liverpool and District and West Lancs Championships. Steve Bullock, who won the Club Fell Championship the previous summer was a popular winner of the Cross-Country Championship after several years of trying. The Track and Field Championships were again of interest in the emergence of new names and talent. John Halson took the Sprint and Middle distance section, Chris McFadden the Long distance, and our fairly recently , invaluable acquisition Merrik Bousfield took the Field events section with some fine throwing. the Ladies were also involved, and Elaine Spencer (formerly Bishop) won the Ladies Track Championship. On the 1st May 1988, Sefton in cooperation with OXFAM, staged a 10km Race/Fun run at Croxteth Park. this was a new departure for us, and it was a success. everybody who was involved, enjoyed the experience, and something in excess of £1000 was raised for OXFAM. there is every sign that this could become one of “those annual events”. As the 1988/89 season approached, there was a feeling of excitement in the Club at the prospect of the Centenary year. For us to achieve something special in this special year, is everybody’s wish, and if we do not, it will not be for the want of trying. After finishing 2nd team in the first and second Liverpool and District Cross-Country League races, we were disappointing 4th in the Liverpool and District Championship at Arrowe Park. this season we were once again hosting the west Lancs Championships at West derby, and a cold bleak day it was. Out team ran superbly to take silver medals in the team race with their best cross-country result for some time. The Centenary year had started well! Good news came swift from the Ladies Section, when for the first time, a complete Sefton Ladies team took part in the Northern Championships and finished a very creditable 17th. Another ladies first was recorded at the 1988 Christmas Handicap when recent signing Avril Jones was first home to win the Barry Charnock Trophy. The date of our 1989 Club Cross-country Championship was 28th January 1989, and for the this occasion the weather was at it’s best. There was an air of excitement as a total of 40 runners lined up in the bright winter sunshine, to be started by Club President Reg Vaughan. In keeping with the special nature of the event, we were treated to some fine racing. In a very hard fought tussle Steve Bullock won a narrow victory over Nick Hoyle, who at one stage looked as if he was going to be Centenary champion. The junior Championship went to Lee Cadwallader, while Peter Wilson retained the Boy’s title that he had won the previous year. The Ladies Championship was won by Gill Darby. In what is left of this, our 100th year, there will no doubt be memorable and happy occasions, and more fine performances from teams and individuals, but the Club Cross-Country Championship day at West Derby was certainly a high spot in the Centenary year, and the appropriate moment to end the story of our first 100 years.